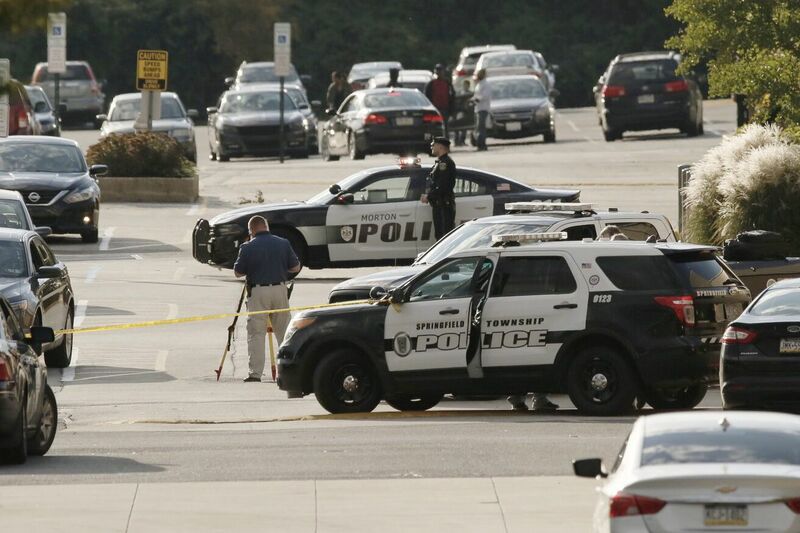 Police investigate a shooting at the Springfield Mall in Springfield, Pa. on Oct. 20, 2018. Police have arrested a 31-year-old man in connection with an exchange of gunfire that terrorized patrons and employees at Springfield Mall in Delaware County last month. Waheed Jenkins of Chester was taken into custody for his involvement in the Oct. 20 incident in the parking lot of the mall, the Springfield Township Police Department announced Friday. The department did not specify any charges, and court records had not been updated with the new case. No further information was released. Around 1 p.m. on that Saturday, two groups of males got into a fistfight on the second floor of the mall on Baltimore Pike. They left the mall and went to vehicles in a remote area of the parking lot, police have said. That's when the gunfire erupted. Everyone involved then fled the scene. No one was injured, but four vehicles were struck. Police said one woman was sitting in her vehicle when the shooting started. She crouched, then ran for the mall. Her vehicle was hit twice by bullets. The mall reopened the next day.